Thanksgiving for me means the fun gathering of family and friends, a lot of cooking, eating, football, laughing, more eating and cleaning up. This year there will be more of the same :^D and with that the week prior tends to get a little more hectic than usual. 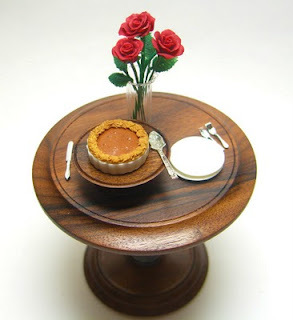 In miniature, a turkey, pumpkin pie and a few roses was all I had time for (the gorgeous rosewood table and pedestal platter was turned by Thomas Saunders). And already the day is here and the 1:1 stuff will soon be on the table, yum!! Wishing everyone a Happy Thanksgiving!!!! 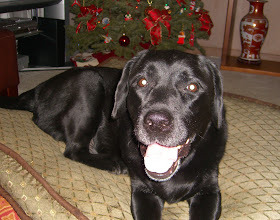 You have a great Thanksgiving , Alison!! Have a good Thanksgiving Alison. I wish I had that pie in front of me now ... if it was a real one, it wouldn't last long!!! Feliz Dia de Accion de Gracias. Que bonita mesa has montado, el pastel es genial. Happy Thanksgiving! 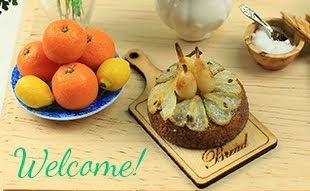 I am very happy (and thankful) that you have joined blogger as well! Thanks, guys! Thanksgiving was a food extravaganza. I had more than my share of pie and am living the consequence today...the treadmill!